26/12/2005 Again, a huge gap between updates. I am really sorry about that, I have been very busy at work. I will have scans for both releases of subsistance soon though, so be sure to check in a week or two. Happy Holidays BTW. 19/11/2005 I'll be leaving for Honk Kong for a week, so I'll be slow in responding my mail. I'll check it as constantly as possible though. 21/10/2005 There you go, Konami just graced us with the english translation of Kojima's blog, as you can see Deltahead translations did their job, and did it well. In other related news, there are indicators that Kojima Prodcutions is working on a Nintendo Revolution game, I'll be waiting for that. 11/10/2005 I went ahead and made a dedicated page to hold the Snatcher references in Metal Gear Solid 4. 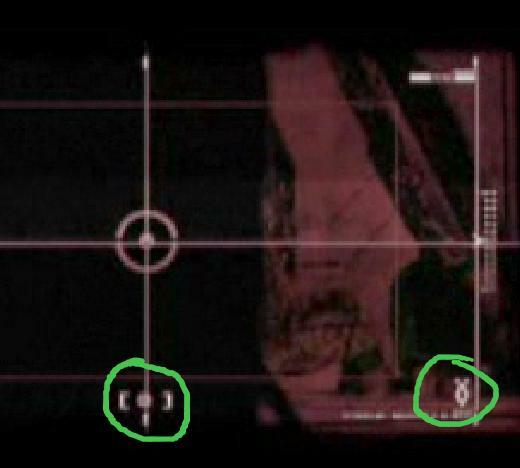 I thank the Deltahead group for the image from Otacon's screen, since I only had very low resolution versions of it. Go check their translation of Kojima's Blog, it is well worth your time. And by the way, he'll go on writing it (thanks to Osiris for the news). 04/10/2005 Devin Franklin has sent 5 new Snatcher wallpapers and an update to the Harry Benson one. They are taken and redone from the Sega CD ending, hope you enjoy them as much as I did. "As a matter of fact, there was a lot of preparation for this past TGS MGS4 trailer presentation. 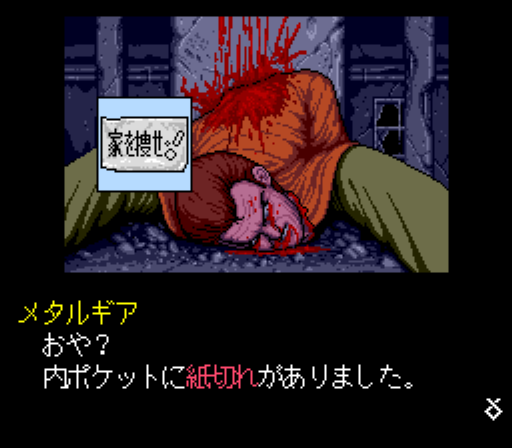 There were a lot of Snatcher references such as the "Neo Kobe" mark, "Search the house", etc. There is one in particular, the sound made when Otacon's manipulated "Chibi Metal" (Metal Gear Mk 2) enters the scene. When Otacon says "It is me, Snake" you can listen to the MSX Metal's voice (chime) in the background." 27/09/2005 Well, Kojima Hideo's blog is now up (in Japanese) at the Kojima Productions site. He makes interesting comments in the development of Subsistence and MGS4. There is an article at IGN, with some translations from the blog. 08/09/2005 Yes I know.. the site has been mostly dead. My machine at home (with the scanner) is still dead, but I've found the time to start recovering the data form the crashed HDD. But not everything is excuses, here is a great contribution by Dave from the forums sent in a great Harry Benson Wallpaper. And also, there is an interesting project called Box Hound, unfortunately I could find no more info regarding it. 24/08/2005 Today is Kojima's birthday, but unfortunately I have no other updates ready. Although I have a bunch of Metal Gear related material, I've barely had time to scan or do the stuff needed due to work. Count with it done as soon as I get some time. 14/07/2005 In the spirit of gathering Snatcher and Policenauts material and references, a page with Snatcher and Policenauts tradings cards in Metal Gear Ac!d has been added to Junker HQ. I threw in the pics of the model cards as well, just for fun. The appropriate links have been added to the Snatcher and Policenauts pages. 10/07/2005 I finally bought myself a PSP and got both Metal Gear Ac!d NA and Metal Gear Ac!d JP, so now you can check their scans in the Kojima Game Gallery (Thanks to Francisco Puente for getting me the last one and the PSP). 30/06/2005 Guess what? Another great wallpaper contribution by Miikka "MP83" Poikela. This time it is a remake from the Snatcher logo screen. You can get them both at the wallpapers section of the site. 29/06/2005 A great treat for Snatcher fans. Miikka "MP83" Poikela sent a cleaned up version of the Konami Snatcher Calendar Image, and it looks marvelous. Hope you guys enjoy it as much as I did. 10/06/2005 Never thought I'd get the three of them, but here is the last one (?) of this great series of figures by medicom. Here are the Real Action Heroes No. 228 Metal Gear Solid 3: Snake Eater Naked Snake, Snake Camouflage Ver. images. 07/06/2005 Images for the Real Action Heroes Metal Gear Solid 3: Snake Eater Naked Snake Squares Camouflage Ver. figure by Medicom Toys are up. 06/06/2005 Well today is June 6. All Snatcher fans know what happened that date in the game, and I got a friend of mine to lend me a scanner that allowed me to get some images in better quality that I wouldn't scan before. It is not much, since I could not scan that much pages without any possible damage to the item, but I got you these. I know is not a big deal, but I guess fans will like them. What I am truly looking forward to is about what The Kremlin will do, it is a tradition to show some stuff. 24/05/2005 Thanks to my good friend Oscar, with whom I went to Konami a year ago, I got the Kojima Productions press kit signed. The images that are up now are nice enough, but I'll upload decent scans tonight. 21/05/2005 The site Metal Gear Universe has changed to a more general profile renamed and remade as Hideo Kojima Universe. Be sure to check it out. 18/05/2005 I changed (slightly) the Kojima game gallery page to reflect which of the games are accepted as cannon by the Kojima Productions team at their official page. I decided to keep demos and pilot disks out of such listing, since they specifically include Document and exclude the others. 17/05/2005 I was still recovering from yesterday's shock with the PS3... and now there are big news for Kojima and Metal Gear fans. First of all, Subsistence (the equivalent to Substance and Integral for MGS3) was announced, and it contains the Metal Gear MSX titles, after all those years these games will finally be available outside Japan aside from online, duel and demo theater modes. But that is not all. This game marks the beginning of Kojima Productions. This team is already working on MGS4, under the direction of Kojima. Trailers are available in the above links for Subsistence, MGS4 and Ac!d 2. And must add, the MGS4 trailer (based on the MGS3 engine) is great, I simply loved it. I believe this is a great development. 15/05/2005 I got some free time and did one of the things that takes a lot of it. The Snatcher group picture has been updated, along with its image map. It is at the Snatcher page, hope you guys like it. 11/05/2005 Again, long time without updates.. but, there's great news for Kojima fans. Thanks to 87th for posting this at the boards, about the new project Kojima's involved in. Not much, but something more to look for during next week. 26/04/2005 The Kremlin is now up and running. With a few new sections for you to enjoy, new music, a new skin that has Snatcher characters and several surprises under some of its regular sections. Make yourself a favor and go pay it a visit. I am really glad such a great site exists, it has been a motivation and inspiration to keep Junker HQ going. Thanks! 25/04/2005 I am really sorry the site has not been updated. I at least have the Extreme Box DVD set scans to upload, but I've been swamped with work. But there's good news anyway, tomorrow The Kremlin re-opens its doors. 02/04/2005 Indeed, Junker HQ's updates have been missing. There are some things that I have not yet uploaded: The Metal Gear Ac!d T-Shirt sent by KOA (special thanks to my pal Oscar Noriega on that one), the contributed scans for the European release of MGS3: Snake Eater and a wallpaper contributed by James from Shadow Moses. Well, enough about stuff that I've not posted. There are two main news that you might care about. First of all, The Kremlin closed for it's annual renewal, until April 26th. We'll be waiting patiently for those changes. Johnny Undaunted was kind enough to post that a new Boktai game is on the works: Shin Bokura no Taiyou: Gyakushou no Sabata ("The New Boktai: Sabata's Counterattack", nicknamed Shintai) for the GBA. Apparently, there's two Djangos now (red and black), as well as a new TNS gauge (for unrevealed purpose). 11/03/2005 Although it is a small update, I am very excited about it since it is the second image I see of it.. and I must say it is the best one so far. Jon Price (Devon, UK) contributed an image of his JUNKER key chain, the one included in the SCC Memorial Joint Disk. 09/03/2005 Chris Brunner just sent in a link with his pictures of today's signing at the UK. Kojima Hideo and Shinkawa Yoji were at a local HMV, and Chris got himself the Twin Snakes GC and the European Limited edition MGS1 package signed. 87th is also posting pics from the European release at the forums. I also will update before this weekend, adding a couple of scans I've not been able to post at Junker due to work, including full scans of the UK release by 87th. 05/03/2005 The Metal Gear Solid 3 English Secret Theater was uploaded yesterday by Konami. If you haven't seen these yet, I highly recommend you do. You only have to answer 5 simple questions to get access to the first four of them. Thanks to Lazy Dave for the heads up. 04/03/2005 A few days ago, in a press conference at Europe, Kojima and his team released the info on "MGS4". In a stroke of genius, the director was revealed: "Alan Smithee", draw your own conclusions. Thanks to Finalfantasy7 from the forums for the news. 25/02/2005 Junker HQ proudly presents to you the Snatcher Manga (re)translation in color by Timo Takalo. I really loved this version of it, in terms of pacing, word selection and preserving the original while westernizing it. Be sure to leave any comments at the Junker HQ Forums. 19/02/2005 Wow, long time without an update... This time it is something small, but that advances the Snatcher Gallery by small bits. The scans for the JUNKER sticker included on the original Snatcher soundtrack, Spine card of the Perfect selection Snatcher Battle and a scan of the Junker Key holder card are up now. 31/01/2005 Great news for Snatcher fans! MrRudi has sent over another track from Snatcher. From "Hands on Snatcher", we get Harry's Retrospection. Go grab it at the Snatcher Music Archive. But that ain't all, there is another surprise waiting for you at the archive. Sad_muso did an arrangement on Innocent Girl, in MIDI format. You can get it at the same place, enjoy! 26/01/2005 Added a very interesting piece to the Snatcher Collection: A version of the Snatcher Sample test Disc at 98%. Read all the info I have gathered at the Comparative page. A topic is open in case you have any info. 21/01/2005 A couple new things. First of all, the scans for the MSX version of Metal Gear are up now, I'll scan some more of the manual later on. Also, a few more contributions: An Eva Model Wallpaper by James from Shadow Moses Island and complete scans of the Metal Gear Solid Pilot Disk contributed by Steffen. 20/01/2005 Lots of contributions lately, I am really sorry about the delay in posting them, but most of them are up now. I modified the Kojima Game Page in a way I believe it is easier to navigate.. I hope it is. Well now for the updates: Metal Gear European NES version, Metal Gear Solid: Special Missions (European VR Missions), European Metal Gear Solid 2: Substance (Includes The Document of MGS2), European Metal Gear Solid: The Twin Snakes and the Zone of The Enders: The Second Runner Special Edition. All of them by 87th. There will be a few more updates tomorrow, since I haven't uploaded a couple of wallpapers and more material. 13/01/2005 Tim Rogers finally published an excellent review of Metal Gear Solid 3 (along his complete review of the whole year) at Insert Credit. There are several very interesting points to comment, I won't spoil it for those who haven't read it but he reveals a left out game play element. Make yourself a favor (If you've played the game of course), and read it. Comment it at the forums. 10/01/2005 A few new updates with more to follow soon during this year, hopefully. Scans of a Calorie Mate, as shown in MGS3 and the Metal Gear Solid 3: Snake Eater Shareholders Edition (thanks to Takamichi for helping get this items). I also received several contributions, that I will upload soon (Sorry about the delay so far).